When using Managed Backup (MBU), you can configure the backups based on tagging. A tag is a label that you can apply to objects in the vSphere inventory. When you create a tag, you assign that tag to a category and categories allow you to group related tags together. 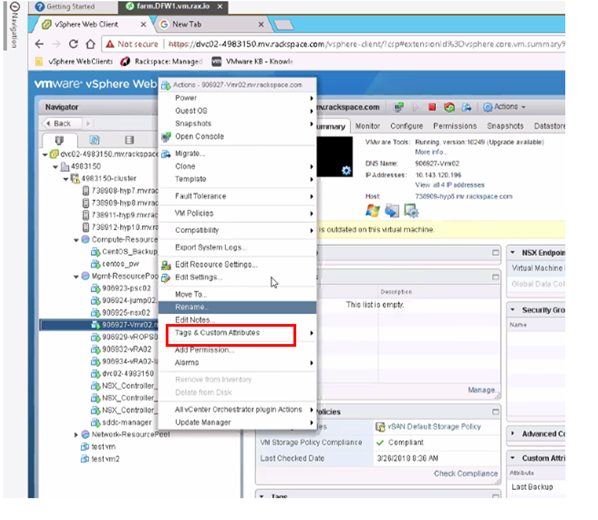 The default RPC-VMware configuration configures backups to backup every VM that reside in a resource pool or cluster. If you use tags, you can explicitly define the content you backup which allows you to remove or add VMs from backup without involving MBU. With tags you can define what content you backup, giving you more control over your VMs. 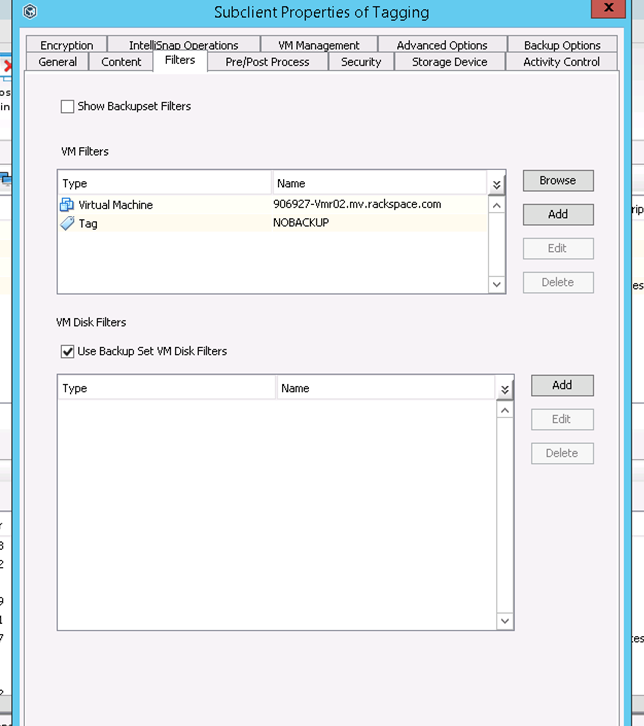 By using tags, you can remove or add VMs from the backup content without involving MBU. Customers that only want certain VMs backed up can have that VM tagged. Rackspace configures only the backup content to a specific tag. Customers that do not want certain VMs backed up can use a Do Not Backup tag to every VM that this applies to. As a result, Rackspace only configures backups for VMs that do not have this tag applied. It is up to the customer or the Rackspace VMware support team to create the VM tags in vCenter. You must ensure that MBU is updated with the naming conventions of the VM tags so that MBU can configure accordingly. 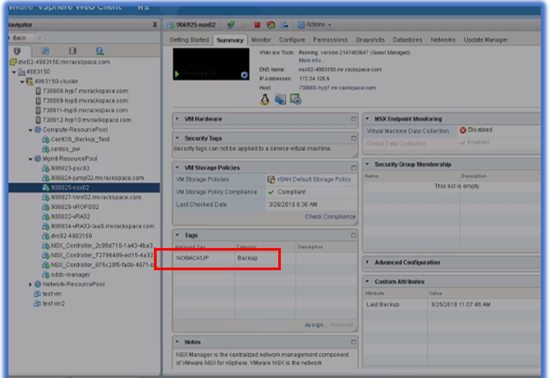 MBU does not create the VM tags in vCenter. For RPC-V customers, Rackspace can exclude a set of VMs based on the Tag in vCenter. The VM tag needs to be setup first in the vCenter before MBU can identify the new options. The following instructions configure backups to exclude VMs based on tagging. This is the most common use case for VM tagging and MBU. Click Add. The Tags and Categories drop-down appears. The filter appears as No Backup. This is because it was tagged in vCenter as No Backup. 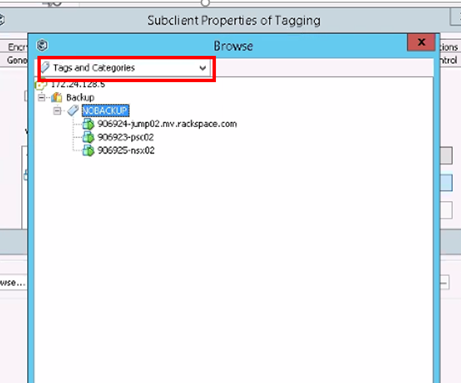 If you want to define content by tagging, contact your Rackspace VMware support team to provide the naming convention for the VM tag. This is so Rackspace can define the content with that specific tag.